(1)Upgrade method can be found in “ZYX-GS User Manual v1.0”. (2)Firmware version and PC software version must be same. (3)The firmware v1.2 will restore factory settings, if you have changed the gimbal parameters you must remember that. (1)Support brushless DC motor gimbal. This function must use “TAROT BLDC driver module”, if you want to change motor parameters you can click “Motor Configration” button. (2)The gimbal control algorithm is optimized. The control frequency has been increased from 800Hz to 2000Hz. (3)PID parameters are adjusted, increasing the acceleration sensitivity is used to suppress the self-excited oscillation. The PID parameters rang has been changed from [0-255] to [0-500]. (4)Initial roll and tilt angle parameter is added: When gimbal roll or tilt angle is not level you can adjust these parameters. (5)Default heading axis servo on or off switch is added. 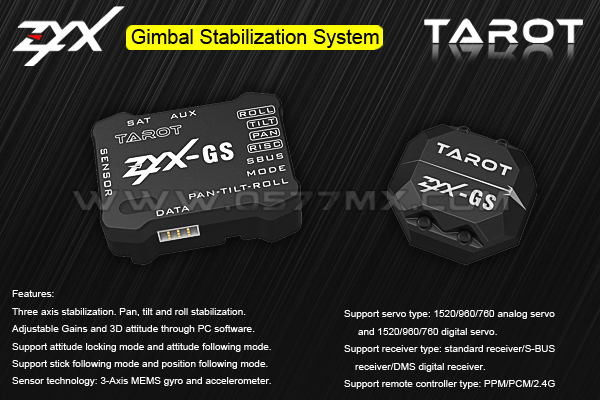 When the gimbal in stick “mode 2”, this parameter can turn on or turn off heading axis servo. In mode 1 or mode 3 the heading axis servo is always on. (1)[Total Gain]: range [0,500].This gain multiplied by other gain is the real gain. Increasing this gain will increase the tracking speed and gimbal stability. But if this parameter is too high it will cause gimbal vibration. (4)[Accelerate Gain]: range [0,500]. This parameter can suppress the gimbal self-excited oscillation. PID parameters range is [0-500], the basic rule is the total sensitivity can not be 0, speed sensitivity and integration sensitivity can not both be 0. If break these rules the gimbal will turn off the motor, this can protect gimbal and camera. First, set the total gain to an appropriate value (e.g. 50), set the velocity gain and integral gain to the minimum value(e.g. 1).Secondly, increase accelerate gain gradually until the gimbal shaking. This value is the largest accelerate gain. Finally, reduce the accelerate gain by 20% as the final gain. First, increase velocity gain gradually until the gimbal shaking. This value is the largest velocity gain. Finally, reduce the velocity gain by 20% as the final gain. First, increase integral gain gradually until the gimbal shaking. This value is the largest integral gain. Finally, reduce the integral gain by 20% as the final gain. After completing the above steps, we can be appropriate to fine-tune each gains and get better result.